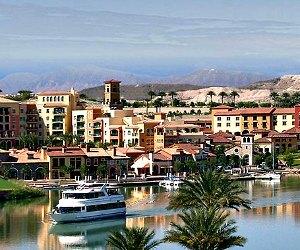 Lake Las Vegas hotels are simply gorgeous! Located at the shores of a beautiful lake, far from the main tourist area - the Strip - these Mediterranean-style hotels offer a peaceful, relaxing vacation. Activities in the include golf, beautiful marina with boat rentals, Casino Montelago. Plus, it's a perfect place for a wedding! Review: Aston Montelago Village Resort resembles a miniature Mediterranean village at the lake, surrounded by pastoral views. It is located just 30 minutes away from the Strip, and a free shuffle is ready to take you to the downtown at any time! This charming and relaxing village resort will embrace you with old-fashioned, European-style buildings that offer variable accommodations, from studios to three-bedroom suites with superb interior and modern amenities, including high-speed Internet access. The resort is famous for its picturesque golf fields and water amenities such as boat rental, fishing kayaking and lake cruises. Visitors enjoy the wide variety of entertaining events at the resort, including festivals, wine tasting and outdoor concerts. 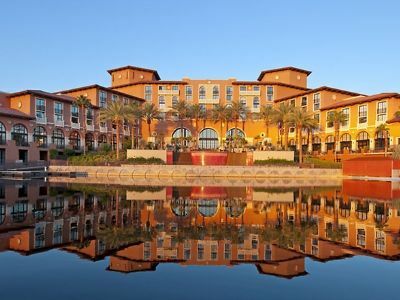 Aston Montelago Lake Las Vegas hotels is an ideal combination of a romantic getaway destination and a luxury accommodation close enough to Las Vegas hot spots. 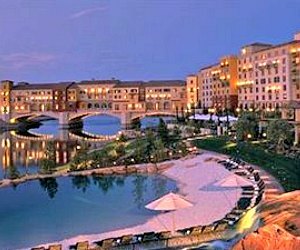 Review: Former Ritz Hotel, and now a part of Hilton family, Ravella is a Mediterranean-style Lake Las Vegas hotel possessing luxury in its every corner. The atmosphere here resembles a peaceful oasis just 20 miles from the Strip. You cannot miss this breathtaking building, as it literally rises from water above the blue lagoon. This contribution to the Venetian architecture adds a unique touch of the Old Europe. Views from the hotel rooms feature emerald royal-like garden, gorgeous marina and manicured golf fields with desert hills beyond. Large guest rooms with spacious bathrooms allow perfect comfort and relaxation. Those who want even more can book one of 35 luxurious suites with exceptional Italian design. Visitors admire a 30,000-square-foot full-service spa, a private sand beach and a variety of active sports options such as kayaking, hiking trails, bike and boat rentals and fishing. For a quick bite, the Lagoon Bar and Grille will serve a drink with snacks right to your poolside daybed. Multiple upscale restaurants and shops are just few steps away. Review: Located just 20 minutes east of Las Vegas, The Westin Lake Las Vegas Resort and Spa (formerly known as Loews and Hyatt) is ideal for relaxing families, and it's also pet-friendly. The impressive reddish-golden building has its own lagoon with sand beach and overlooks the lake with picturesque desert hills on the background. Moroccan-inspired design continues with exotic Rim-inspired foods at Marssa restaurant, Marrakesh Express coffee shop and infamous Rick's Café with a blend of Moroccan and American cuisines. Bittersweet tea fragrances, soft lighting and Mediterranean music fill the hotel with unique atmosphere. Stylish and luxury guest rooms are decorated with elegant antique-like furniture. Large windows allow enjoying fabulous views of the lake and Nevada desert. Named "one of the world's best hotels" by Travel + Leisure in 2011, The Westin Lake Las Vegas hotel has everything you need for both relaxation and entertainment: body treatments at Spa Moulay, a fitness center stuffed with all-you-need equipment, team sport fields and two seasonal outdoor pools. A business center with high-speed wireless Internet access will keep you in touch with the outer world in this oasis of pleasure.